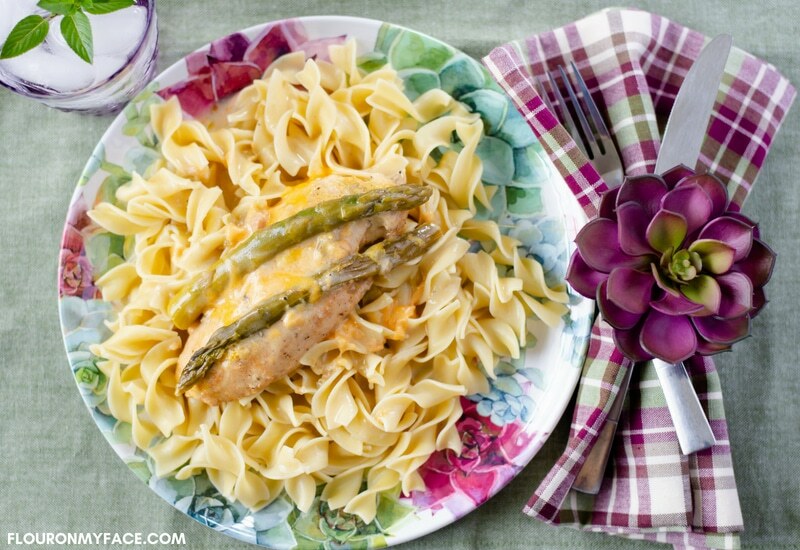 Crock Pot Asparagus Chicken is cheesy tender and delicious. I love using fresh asparagus in my summertime crock pot recipes. Asparagus is one of my favorite summer vegetables. 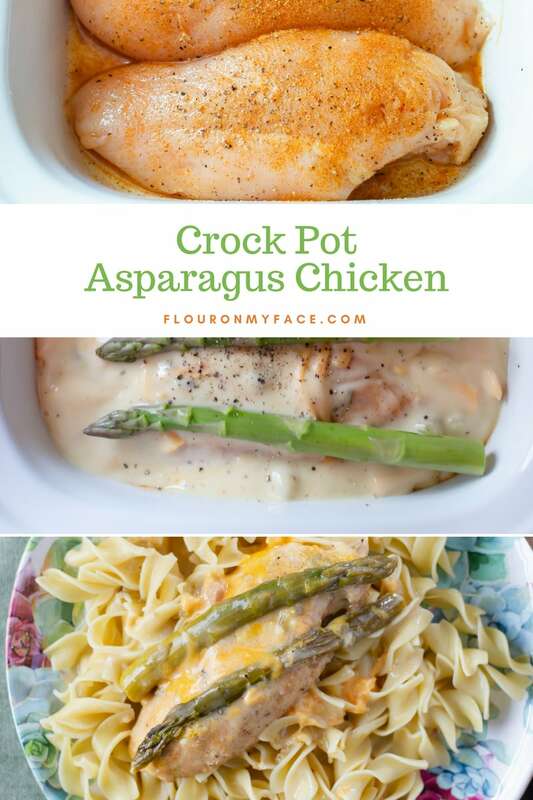 Crock Pot Chicken recipes like Crock Pot Asparagus Chicken is so easy to make. It is one of those easy dump and go crock pot recipes I love. Just dump the ingredients into a crock pot and a few hours later dinner it is ready to be serve. The boneless chicken breasts are moist and tender. The “gravy” is thick and cheesy. Two things are always on sale at the grocery store during the hot summer months. 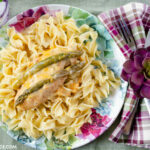 Boneless chicken breasts and in season fresh asparagus. Cooking these two ingredients together in the slow cooker accomplish a couple of things. First off cooking in a slow cooker during the hot summer months avoids heating up the house by cooking on the stove or using the oven. I don’t know about where you live but it is scorching hot here in S. W. Florida. My ac unit can’t keep up with the heat! 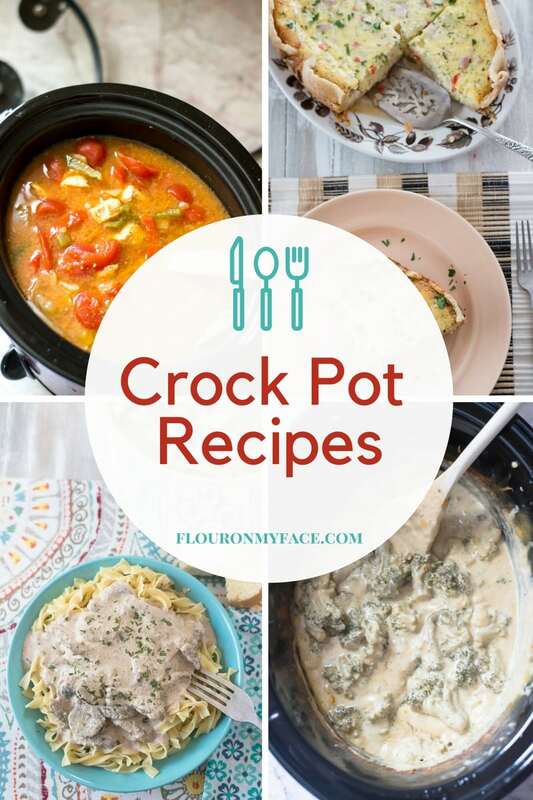 My crock pot is a life saver during the hot summer months! Secondly, you save money at the grocery store by buying ingredients when they are on sale and at their lowest prices. Stock up when the prices are low to help keep the grocery store bill low! Buy boneless chicken breasts in bulk and freeze it in meal size packages to use for other summer meals. So far this crock pot boneless chicken recipe has been one of my favorite crock pot chicken recipes. If you really love asparagus you could add more to the crock pot while it is cooking. Or you could cook some fresh asparagus in a skillet and serve it alongside this Crock Pot Asparagus Chicken recipe as a side dish. Place the boneless chicken breasts into a crock pot in a single layer and season both sides with the Lawrey’s Seasoned Salt and ground black pepper. In a mixing bowl mix the canned cream soup with the milk until combined. Add 1 1/2 cups of the shredded cheese and mix. Pour the soup mixture over the chicken breasts in the crock pot. Sift the chicken around so some of the soup seeps beneath the pieces of chicken. Arrange the fresh asparagus pieces over the top of the chicken and season with more ground pepper. Cover and slow cook on high for 4 hours on low or for 6 to 8 hours on high or until the chicken is cooked through in the center reaching 165 of a meat thermometer. Before serving sprinkle the remaining 1/2 cup of shredded cheese over the cooked chicken and allow to melt. Serve over cooked white rice or cooked noodles. 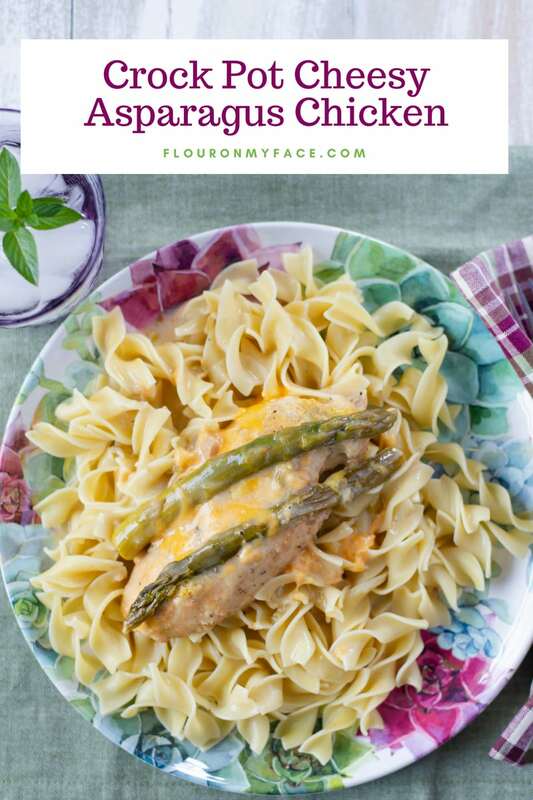 This Cheesy Crock Pot Asparagus Chicken Recipe is a great summer crock pot recipe that takes advantage of using summer fresh asparagus and boneless chicken breasts. Place the bonesless chicken breasts into a crock pot in a single layer and season both sides with the Lawrey’s Seasoned Salt and ground black pepper. Check out all of the Flour On My Face Crock Pot recipes on the Flour On My Face crock pot recipe page. I made this for dinner last night and it was great! Two things: First, the recipe didn’t specify how much asparagus to use; I used an entire bunch. Second, it also doesn’t say what to do with the remaining 1/2 cup of cheese, so being a cook, I put it on top of the chicken when it was plated. Otherwise, it worked. Glad you enjoyed the recipe. You can use as much asparagus as you like. The remaining 1/2 cup of cheese did go on at the end in the slow cooker to melt. I’m confused how long you put it in for? 4 hours on high or low? The cooking times are 4 hours on high or 6 hours on low.